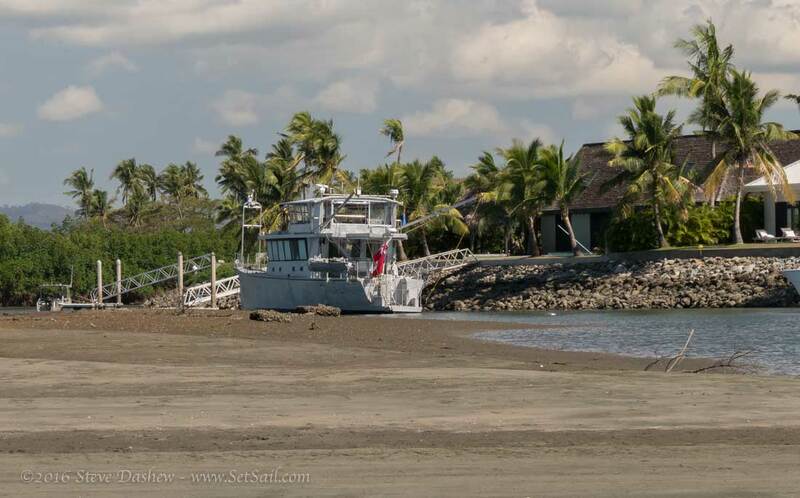 We are “anchored” in Denarau, visiting friends on the leeward side off the big island in Fiji. The breeze is non-existent to light, and it is hot–very hot. Perfect conditions to test air conditioning and ventilation. Working Cochise into the narrow slot where you see her above was great fun. First we surveyed the area with the dinghy. We found barely enough room at a two-thirds tide to get into position, and knew for certain that below half-tide, as shown above, part of the hull would be on the bottom. We needed a plan to hold the boat in position, out of the already narrow channel, in such a manner that we could extricate ourselves if the wind commenced to blow. Oh, and the dock shown is much too light for our size. 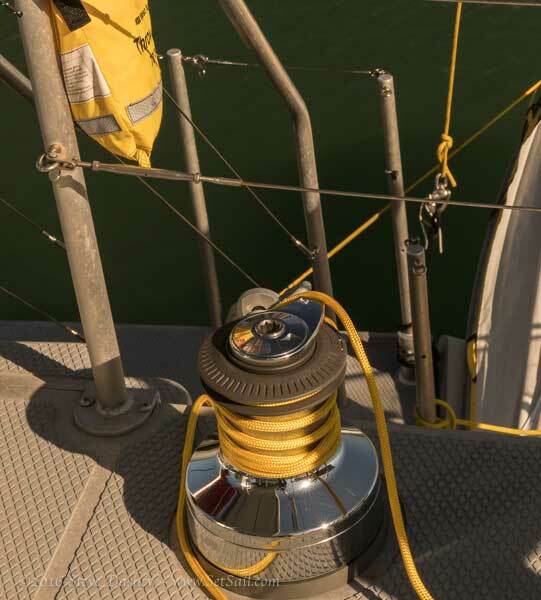 We prepped Cochise by bringing the large Fortress (FX 125) anchor aft to the swim step, and attaching one of our 300’ (90m) spectra shore fast lines. 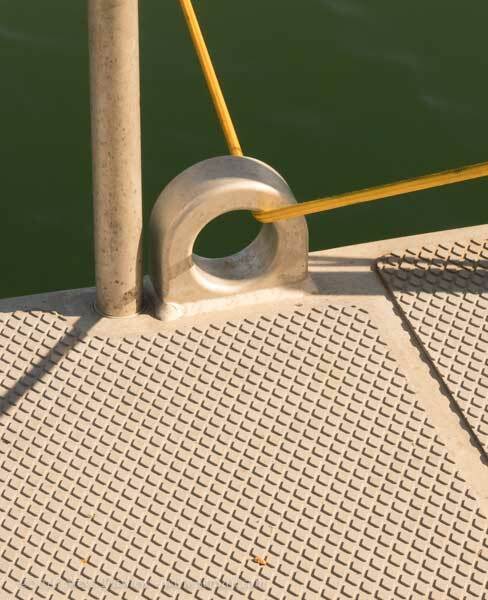 The anchor in the photo above is our smaller kedge. to the Lewmar 65 seat tailing electric kedge winch aft. The dinghy was over the side, ready to be used as a tug, and the smaller Fortress kedge was ready to deploy if required. Two long 3/8” spectra lines were flaked and ready as shore fasts. As we came slowly down the very narrow channel, the kedge was dropped about 150’ (48m) from where we wanted the boat centered. The rode was paid out from the reel until near the end, at which time the big Manson Supreme bow anchor was dropped in three meters (ten feet) of water. As chain was paid out the stern rode was winched in, keeping Cochise centered in between the two anchors. 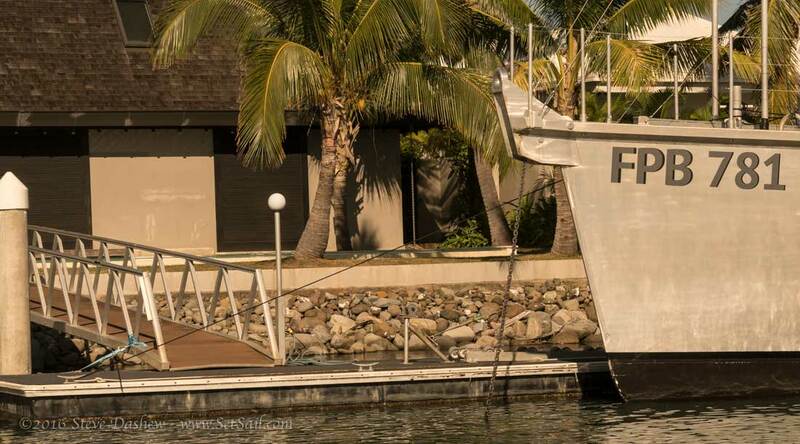 A “bow” line was taken across to the dock, and a breast line ashore to a palm tree. We are bow forward, as this area is shallower than aft, and our deepest draft is at the skegs and rudders. 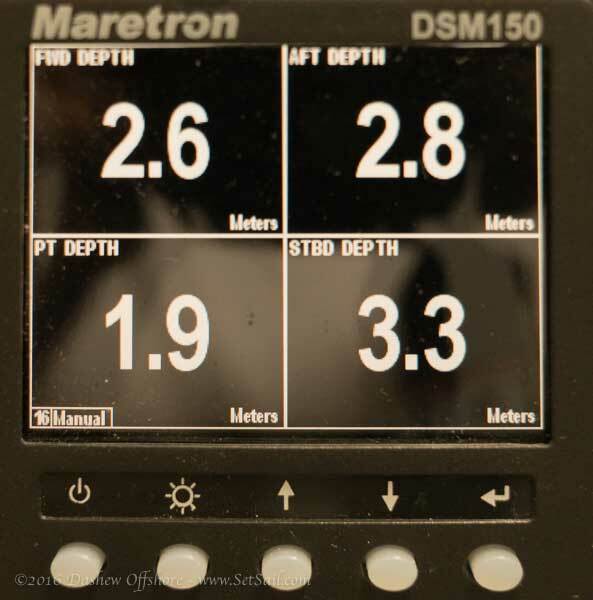 Our four depth transducers, forward, aft, and at both stabilizers, are now showing their value in this tight draft environment. The dinghy is used to get ashore. Both anchors are splayed outward, to give us some angle should the wind switch onshore and onto our beam. It turns out that we are aligned almost perpendicular to the sun’s path, so we’re ideally situated for good solar output. How good? Our ten 340 watt panels are averaging 15.8 kW, or 619 amps in our 24V system. This area is warmer than anywhere else we have visited, the breeze is light-to-calm, but the evening temperatures do cool quickly. To the locals this is winter. To us, used to New Zealand winter, it is uncomfortably warm. The Matrix deck is the favorite spot. There is almost always a cool breeze, sufficient to keep us very comfortable. The four windows, two doors, and entire back are open. We love this area. By 1400 local the great room is 89F. Running the two 12,000 BTU compressors and the single 24,000 BTU unit, in 30 to 45 minutes this area is down to 78F, after which a single 12K BTU unit, or two running part-time, handles the job. Note that in this climate having windows covered in direct sun is essential. We have adopted a modified version of the plan that has worked over the years, to maximize comfort while minimizing genset time and environmental impact. During the day we hang out in the Matrix deck with its breeze. As evening approaches, we adjourn to the great room, and light off the genset. All air conditioners are then engaged throughout the boat, and in an hour the temperature in the great room and staterooms is in the 72-76F range. We are still learning the best use of air con at night, but right now we drop the temperature to 74F, and then reset the thermostat to 80F. The air con fans run, but the compressors rarely come on. The result is very modest drawdown on the batteries. 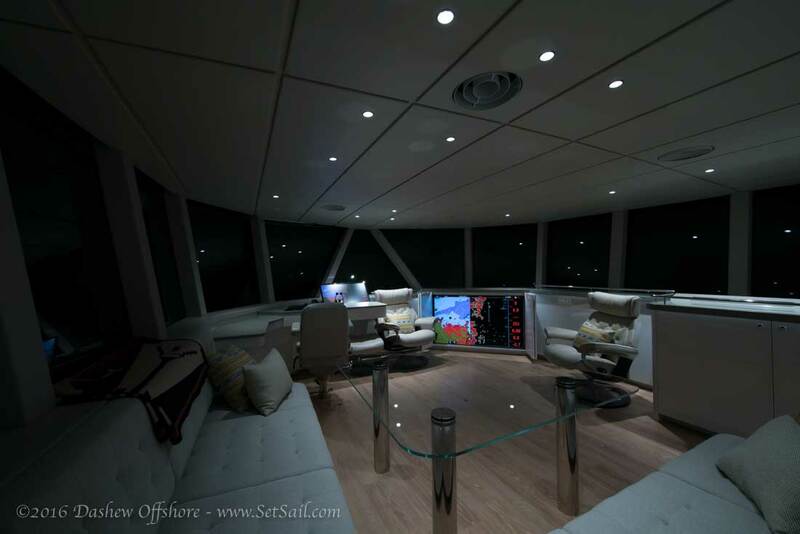 With the master stateroom and one guest room operated in this fashion, typical power burn is around 550/600 watts per hour. At this rate we can go a long time, three or four evenings, before thinking about recharging the batteries. 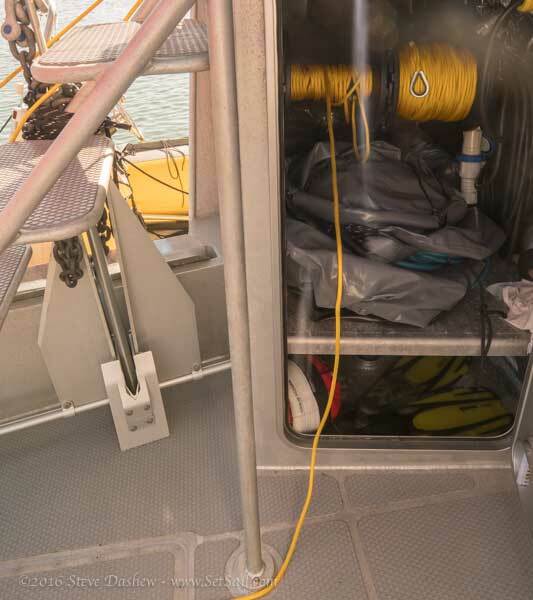 By early AM, exterior temperature has cooled sufficiently to where the vent fans keep the boat comfortable. 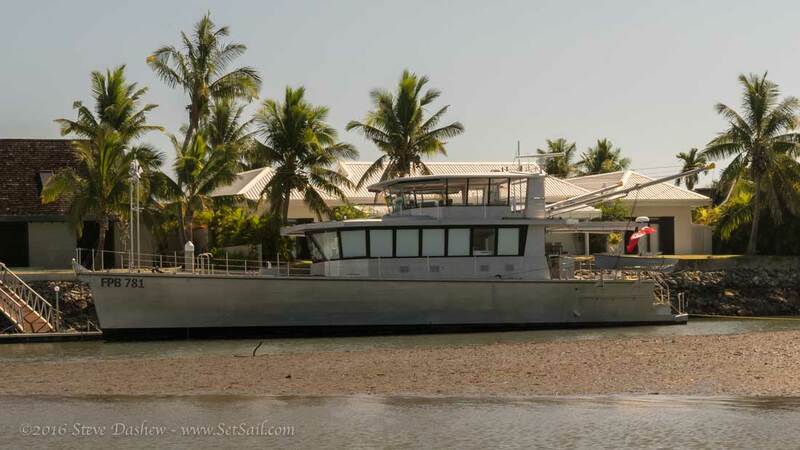 Without the benefit of moving the boat periodically, it looks like an hour or so a day on the genset, plus solars, will see air con and normal power consumption in balance in this warm, windless environment. 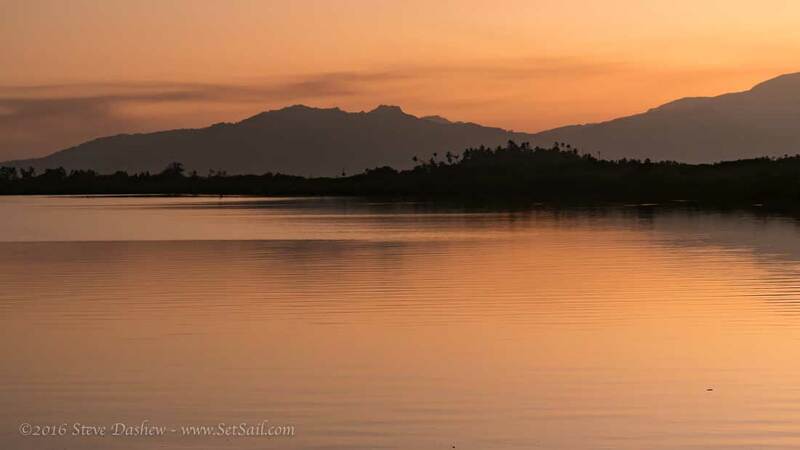 If we are moving the boat periodically, we can carry three staterooms on air con in the evening during sleeping periods, for several days, on batteries alone. The powered extraction fans in the great room pull a lovely breeze through the headliner vents when the air is otherwise still. If there is just a few knots of breeze, these four vents do a great job of keeping the great room pleasant without the extraction fans. Each of these vents can be directed at a seating position. You can see the four large vents in the great room headliner above, and below. These are fed through water shedding grills in the roof overhang and Matrix deck coamings. The natural ventilation patterns of the boat, coupled with the insulation, reduce the need for air conditioning to a minimum. The great room ventilation has been so good that we often reduce the flow from the four large Dorade vents. 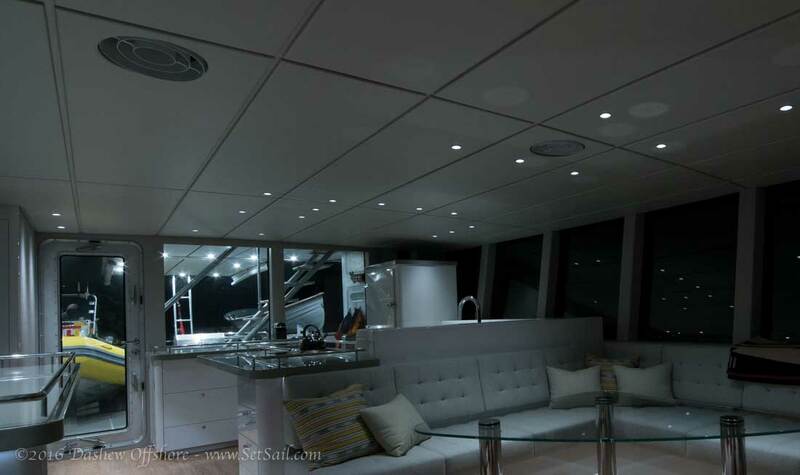 If the foredeck hatch and great room entry door are left open, the breeze will flow forward through the great room (station wagon effect), down the stairwell, and out via the foredeck hatch. With engine room doors and swim step door off the workshop open, the flow is reversed, with the air rushing in through the forepeak hatch and out aft. The powered vent system in the heads and stateroom has sufficient capacity that in the evenings it is run at the slowest speed. The only time we have found air conditioning necessary is when first entering the staterooms at night. We can run the air in all three staterooms for two or three nights on the batteries, even with cloud cover reducing solar output. We are in the early phases of learning to use Cochise efficiently. 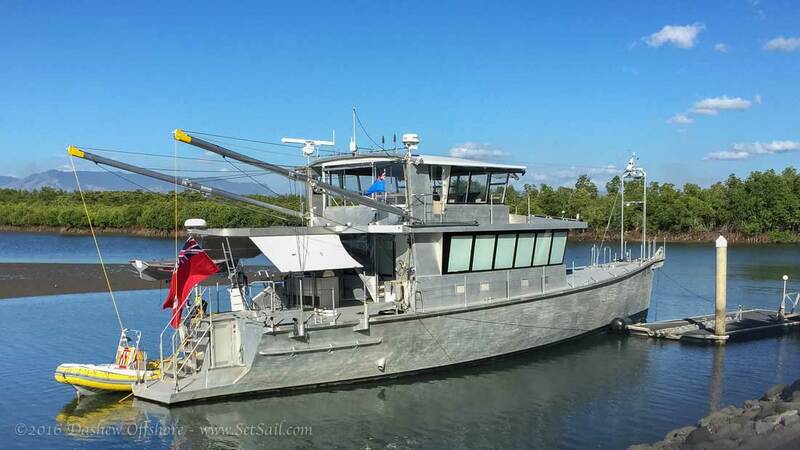 She will benefit from a couple of awnings, and a forepeak hatch cover that will increase the amount of wind funneled through. We also have a couple of wiring changes we think will benefit the solar output. Her windows are clear, as we did not want to commit to a reflecting film or external covers before seeing how things performed in the real world. We have a feel for that now, and so are beginning to think about fine-tuning what is by far the most efficient yacht we have ever cruised. Early mornings, before sunrise, are cool. 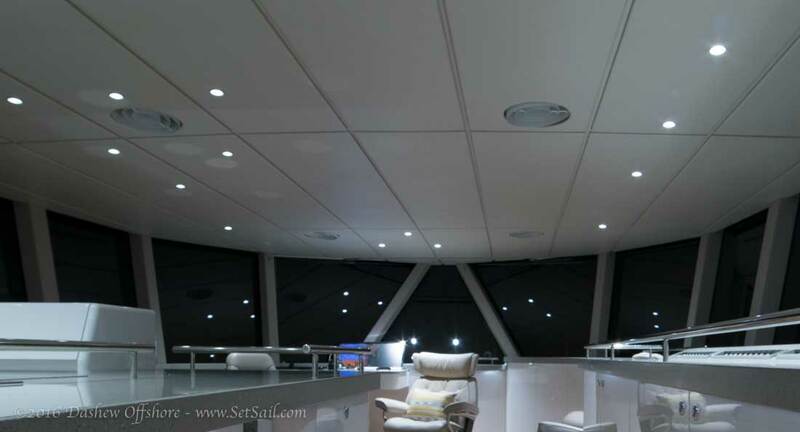 Even when it’s calm the powered air ventilation system swathes us in a refreshing embrace. Stay tuned, there is lots more to come. This entry was posted on Thursday, September 22nd, 2016 at 7:41 am and is filed under Dashew Logs, FPB 78, The Logs. Both comments and pings are currently closed. And the collection of energy is improving. love the aft deck awnings. Nice to see the boat at anchor here at Musket Cove after reading about it on the blog. Come by and have a closer look. Curious, are those fair leads solid aluminum, or hollow?